A 3-issue miniseries delving into the past and future of Destiny of the Endless, with painted covers and framing sequences by Kent Williams. In the year 2009, a small town holds out against a devastating pandemic, its remaining inhabitants desperately hoping to survive the next outbreak of plague. 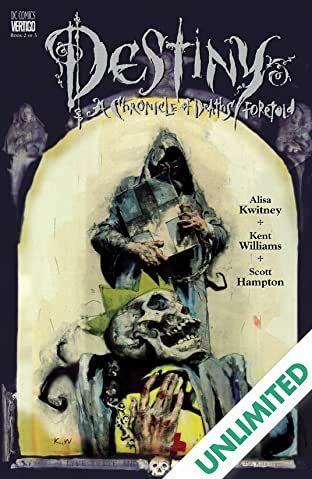 Then a mysterious stranger arrives from nowhere, selling a page that he claims is not only taken from the Book of Destiny, but also foretells the four great plagues of humankind, including where the current one will strike next. 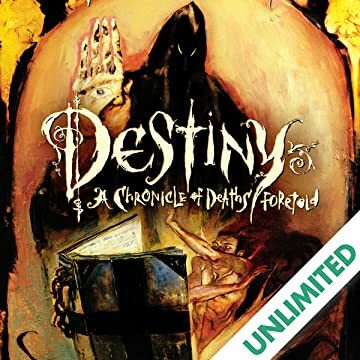 To convince them of its worth, he offers to read from the page, revealing Destiny's role-as well as his own-in the previous three plagues, starting with the epidemic that struck the Byzantine empire.